The woman in the gif below just said to Captain Picard that she can show him the definitive and complete list of the 200 Google ranking factors. Picard, who is a wise man, can do nothing but walk away with a facepalm. Who can blame Captain Picard for his reaction? We all know, in fact, that a complete and ultimate list of the 200 ranking factors does not exist. 318 linking root domains it earned testify). Are presented just to reach the number of 200. Giorgio Taverniti, revealed it to me. Press Day on May 10th, 2006 (you may also want to read the live blog Matt Cutts did, as it illuminates many things that happened thereafter). Seeing that the correct phrasing was “over 200 ranking factors,” we can say that “200” was an approximated number, perhaps offered to journalists in order to explain how complex Google’s algorithm is. If the audience had been composed of information technologists, Alan Eustace would probably have used another wording. Are you sure you really know what “ranking” and “indexing” mean? I ask you this because I know many SEOs who use both words as synonyms, when they are two completely different concepts and stages of how a search engine works. Indexing is the process of locating and mapping resources around the web that are associated with a word or phrase, and it is something the search engines do, not SEOs, even if SEOs can help their work optimizing a site. Enrico Altavilla, is used to determine what resources to suggest as an answer to a query and the words/phrases composing it, not in what order to suggest them. That is the function of the ranking phase. Ranking is the final moment of the fourth phase: Search. Context plays a major role in the Search phase, and almost every step takes into account the user’s and device’s characteristics. Filtering & clustering. Once Google has understood the input and retrieved the corresponding documents from the Index, it applies filters like Panda and others spam filters, but also less considered ones as the Safe-Search filter and the often forgotten Private Search layer (personalization). We should not forget, then, that content and layout composing the SERPs depend a lot on things like the device used. SEOs are talented professionals with a natural tendency to develop a manic-depressive psyche. Ok, I have exaggerated a little bit, but—and I am an SEO, too—we live moments of pure joy when we see that our work is making the organic traffic of a site rise up and to the right, but also sudden dark periods of (unconscious?) anxiety when Google announces an update or we see a small traffic drop. For that reason, we love ranking factor lists. We need them not just as a potential source of information, but because they reassure us, too. even if they are just a sequence of myths. 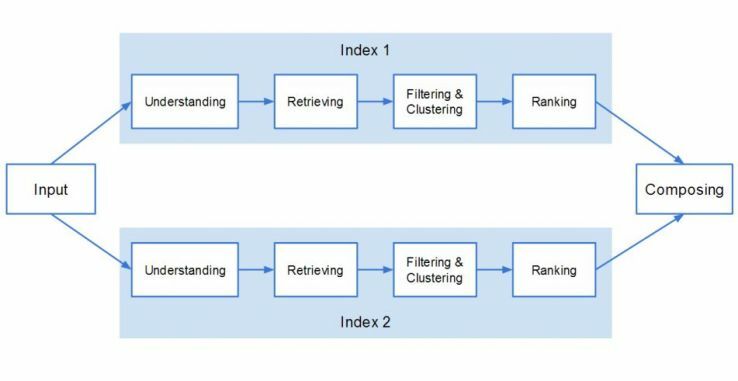 Google’s 200 Ranking Factors,“, published by Backlinko, which I use for no other reason than it being the most recent successful list published. although not as important as it once was, keyword density is still something Google uses to determine the topic of a webpage. Keyword Density never was a Google’s ranking factor. Never. If keyword density ever had some relevancy as a ranking factor, it was in the Pleistocene era of search engines. We live in 2014 and Google just had its 16th birthday. It is still obviously important having the keyword we want to rank for in the text of a web document. However we also know that it is also possible to make our site ranking for that keyword without having it at all in the page, if Google finds enough consistent and relevant external signals, which associate that keyword to our site. Latent Semantic indexing was invented and patented in 1990, before there was a web. It was developed to help index small (less than 10,000 documents) databases of documents that didn’t change much (like the Web does). There have been a number of companies that started selling LSI Keyword generation tools that promised that they could help identify synonyms and words with the same or similar meaning. Where those fail is that the LSI process requires access to the database (of documents) in question to calculate which words are synonyms – and the only people with access to Google’s database to do that kind of analysis (which isn’t possible anyway since Google’s index is much to big and changes much to frequently) is Google. There’s no doubt that YouTube videos are given preferential treatment in the SERP . How can be this a ranking factor? Eventually it is a monopolistic use Google does of its own search engine, but a ranking factor? hese lists tend to be everything but scientific, hence unreliable if not even dangerous. What Brian says is correct: if Google, despite of several attempts, see that a site returns a 500 server response, then that site will start being pushed out of the SERPs. we are talking about an Indexing issue caused by a Crawling problem, not a Ranking one. As I wrote before, meaning is important. new edition of that survey, and the opinions the same SEOs had were quite different. opinions from SEOs; they should be considered (with all the disclaimers) possible, but based more on personal experiences. Any opinions, although authoritative, are just opinions and not science, let alone ranking factors. It is true that cTLDs offer a stronger geo-targeting indication to Google than geo-targeted subfolders and subdomains. However, as any international SEO can confirm, a web site with a cTLD domain termination does not necessarily rank better than a generic domain name. State of Digital, I presented many examples where sites with “Latin American” cTLDs were outranking .es ones in Google.es. In the comments to the posts, then, you can see that this is something common in every regional version of Google. How can something described this way be a ranking factor? “Some think?” Who? The university student ranting in a forum? A information technologist? 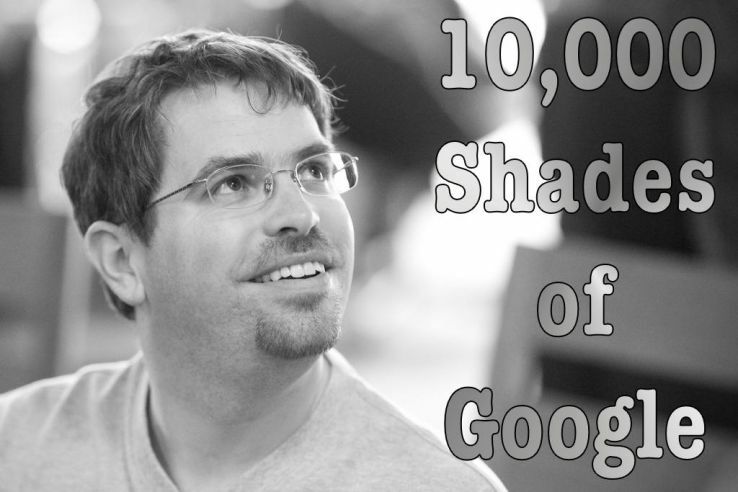 An insider in Mountain View? This is purely speculation. When we talk about how dangerous doing some kinds of guest posting can be, we are talking about web spam. we should talk about “Spam Filters” (3rd Stage of Search) and not actual ranking. Google cannot see likes and Facebook shares. So they cannot be a ranking factor. Period. We like standards that are available on the open web. If we’re not able to crawl something – like Facebook or like the time we temporarily ran into problems with Twitter – we don’t want to depend on that data. The biggest mistake here, though, is confusing causation with correlation, and the power of Social Signals is a correlation power. Social shares > higher visibility > creation of 2nd tier backlinks (e.g. on Topsy) and improved opportunities of earning natural backlinks from people who discovered that shared content. Here, we are at the limits of the absurd. a branding signal is not a ranking signal. that Rand Fishkin wrote back in 2011. Unfortunately, that post was saying something completely different. Rand exposed his (correct) hypothesis that, in the future, Google would start looking at “branding” signals in order to create named entities able to reflect the offline relevancy of an online presence. In that post, Rand never cited the “Employees listed in LinkedIn” as a factor. I could continue, but it is not my intention to write a full rebuttal post. nothing good can come of your taking these lists at their word. My intention is to exhort people not to create them. something that spreads a fallacious vision of SEO, which will reach the eyes and minds of a mainstream audience of non-SEOs: businesses’ owners and marketing executives, who will see the list republished in sites like Hubspot or Entrepreneur. 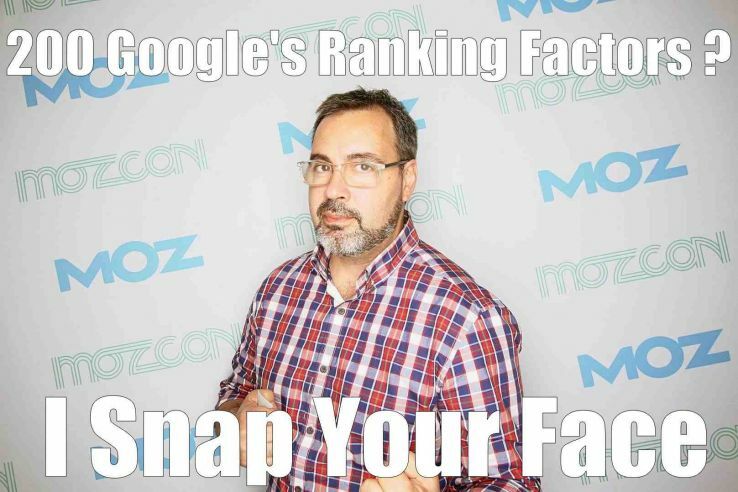 Are all Google ranking factor lists bad? Moz Search Ranking Factor Survey cited before, and the Searchmetrics Ranking Factors study are the most shining examples of that. Nevertheless, there exists a huge difference between those studies and a simple infographic/post listing the supposed 200 ranking factors: they are correlation studies executed following a solid scientific method. correlation studies; hence, they are just telling us what common characteristics the sites that are ranking high in the SERPs have. Use them as inspiration for best practices to follow if they really are applicable to your site, nothing else. It should always present a disclaimer about its subjective nature. the best idea I can offer you is to experiment yourself. Create a site, test theories, try to break the rules for understanding how Google is possibly working. joining the IMEC Lab that Rand created a few months ago. As much as content and advertising agencies would like you to believe it, content produced by a business doesn’t just go viral on it’s own. There is often something that pushes it really, really hard when it first goes live which gains momentum, and eventually the content is spread far and wide enough that it doesn’t need you to push it anymore. Those of you who have read Good to Great may be making associations with the flywheel principle, but that’s a post for another day! In this post I want to talk about one of the ways you can give your content a nudge in the right direction and get more people looking at it: Facebook advertising. I won’t go into too much detail on the basics of Facebook advertising; there are lots of resources and posts out there which do this. Instead, I want to dive straight into the methods you can use to promote your content to an audience on Facebook. 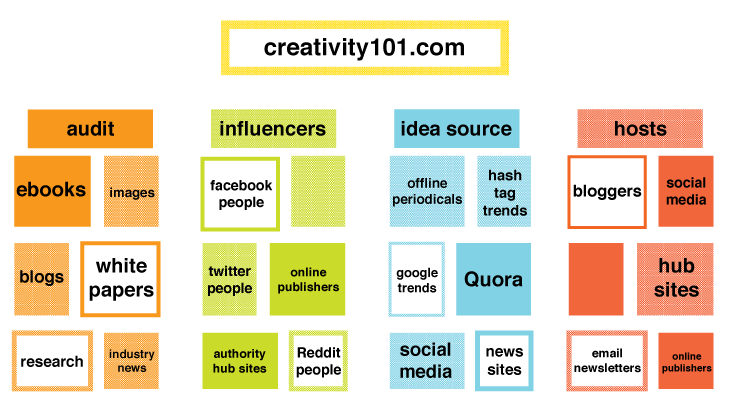 These methods allow you to push your content to a wider audience, but in a very targeted way. Yes, you are paying to advertise your content, which may feel a bit strange. However, it can be a great way of supporting your outreach and PR efforts. You can use a feature called custom audiences to define exactly who it is that you’d like to advertising your content to. When it comes to promoting your content, getting a lot of traffic to the content is good, but ideally you don’t just want random visitors, you want targeted visitors. Whilst it is unlikely that you’ll generate loads of direct conversions from a piece of content, you still want to attract visitors who you stand a chance of converting to customers at some point in the future. As you can see above, you can get very granular with standard Facebook targeting. 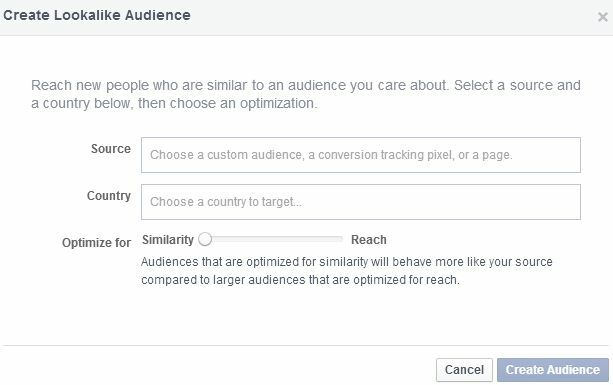 Custom audiences allow you to do even more and mix in data from your existing, non-Facebook customer lists too. This means that you can promote your content to an audience that is already somewhat engaged with your brand and is a little bit more likely to be interested in it. This is far better than a scatter-gun approach where you just try and get as many eyes on a piece of content as possible – regardless of how targeted they are. Let’s go through each of these in turn and look at what they can do. Once you’ve uploaded the file, it shouldn’t take Facebook more than an hour or so to process the file and find matches from its users. Note that you need to upload a decent number of records in order to target them, Facebook recommends at least 100 people. Otherwise, the audience is likely to be too small to have any kind of impact or reach. From here, you can just create an ad as normal but it will be targeted just at this list of people. I love MailChimp, we use it all the time at Distilled. Facebook makes it super easy to connect to your MailChimp account and target your email list. If you have a list of customers or newsletter subscribers, then they are already familiar with your brand. So targeting them and showing off your awesome content could help bring them back to your website in a way that isn’t directly sales / conversion focused. This can also work well to try and drive more traffic to your Facebook page or to generate likes, etc. I haven’t had the opportunity to try this one yet, but it’s clear that it could be pretty powerful if you have a mobile app and are able to integrate the Facebook SDK for iOS or Android. Basically, you can record user interactions with your app and choose to bucket people who take certain actions into a custom audience. 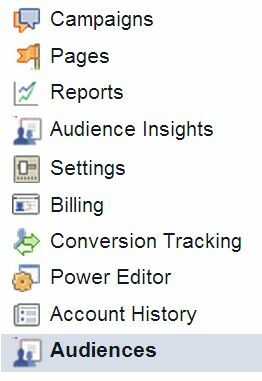 This feature allows you to track visitors to your website using a Facebook remarketing pixel. Once you’ve installed the pixel, Facebook will begin building a list of visitors to your page who are also logged into Facebook and push these people into a custom audience. There are loads of ways to use this, but I’ll come onto a very specific way you can use this shortly. 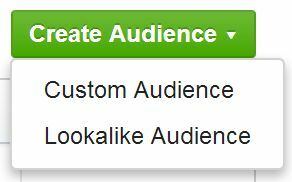 There is a lot of power in the lookalike audiences feature on Facebook, I’ll talk through a few examples, but first, let me briefly explain what lookalike audiences are in case you’re not familiar. Once they’ve discovered the trends in this data, they find other people on Facebook who share these trends and put them into a new list. You can then push adverts for your content towards this list of people. The beauty of this method is that you’re reaching a brand new audience in a very, very targeted way. Again, it’s not a scatter-gun approach of just trying to target as many people as possible. Instead, you’re targeting people who look very similar to your existing audience. I’ll go into detail on these shortly and give some examples of what you can do here. Next, you need to choose a country for your audience. Currently, Facebook only allows you to select one country at a time. So if you wanted to create lookalike audiences across lots of countries, you’ll need to create a lookalike list for each country. The final option is to tell Facebook what balance you want between a new audience that is similar to your existing audience vs. the reach of the new audience. If you’re starting off with a pretty small audience, then you may have to move the needle more towards reach, but I’d generally try and keep things as closely related to your existing audience as possible. Otherwise you’re losing the benefits that a lookalike audience gives you. Next, let’s get into some examples of how you can use lookalike audiences to get more relevant eyes on your content. Above, we talked about how you can create a custom audience by uploading a list of customer email addresses or syncing Facebook with your MailChimp account. This alone is pretty powerful, but you can also use your email list as a source of a lookalike audience. You’ll need to create a custom audience first, but once you do, you can use this as a source and tell Facebook to find you a whole new audience who look like your existing email list. 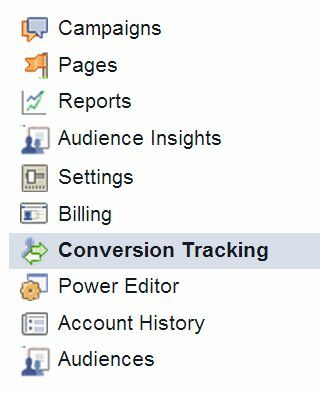 If we placed a Facebook conversion pixel on this page, Facebook will detect those people who view the content and are logged into Facebook at the same time. This means that when grouping all those people together, Facebook will probably find shared interests, demographics and likes which they can use to define a new lookalike audience. 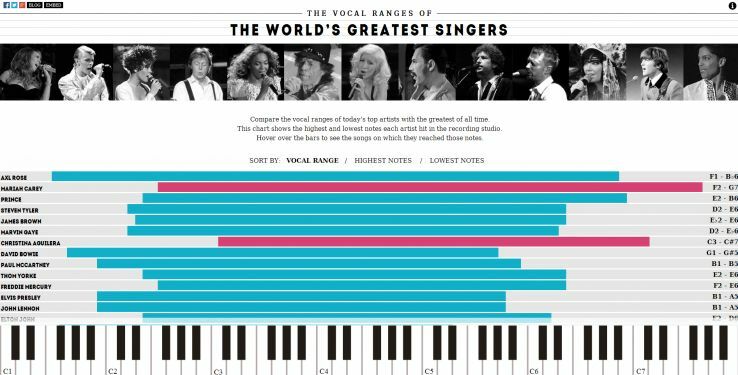 In this example, the new audience is likely to be interested in music and gigs. If we then advertise this content to this new audience, it’s likely to get their attention because they will be similar to the existing audience who are already viewing the content. This is super, super targeted. The first step is to place a Facebook conversion pixel on your piece of content. You can do this by following these steps. Next, Facebook will give you some tracking code which you need to paste it into the <head> section of your page. That’s it! 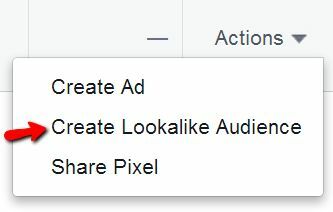 You can then select this new lookalike audience when you create an ad and push adverts for your content towards people who share the same attributes of people already viewing your content. Hopefully you can see the power of Facebook ads, in particular the custom and lookalike audience features to help you promote your content in a very, very targeted way. It may feel a bit unnatural to pay to promote content (and not your product) but this is a very cost-effective way of reaching a big audience and it can really help support your regular outreach efforts. Technical SEO master class with Alan Bleisweiss, Jaimie Sirovich and Carter Cole via Google Hangouts on Air in February 2013. What if I told you I could teach you to write the perfect headline? One that is so irresistible every person who sees it will click on it. You’d sign up immediately and maybe even promise me your firstborn. But what if I then told you not one single person out of all the millions who will click on that headline will convert? And that you might lose all your credibility in the process. Would all the traffic generated by that “perfect” headline be worth it? headline science and the curiosity gap, Trevor (your faithful editor) and I (a recovering copywriter) started talking about the importance of headlines and what their role should be in regards to content. I’m for clickability (as long as there is strong content to back the headline) and, if he has to choose, Trevor is for credibility (with an equal emphasis on quality of the eventual content). What’s the purpose of a headline? Back in the good ol’ days, headlines were created to sell newspapers. Newsboys stood on street corners shouting the headlines in an attempt to hawk those newspapers. Headlines had to be enough of a tease to get readers interested but they had to be trustworthy enough to get a reader to buy again tomorrow. Competition for eyeballs was less fierce because a town only had so many newspapers, but paper cost money and editors were always happy to get a repeat customer. Nowadays the competition for eyeballs feels even stiffer because it’s hard to get noticed in the vast sea of the internet. It’s easy to feel a little desperate. And it seems like the opportunity cost of turning away a customer is much lower than it was before. But aren’t we doing content as a product? Does the quality of that product matter? Nahai advises that you take advantage of psychological trigger words like, “weird,” “free,” “incredible,” and “secret” to create a sense of urgency in the reader. Can you possibly wait to read “Secret Ways Butter can Save Your Life”? Use question headlines like “Can You Increase Your Sales by 45% in Only 5 Minutes a Day?” that get a reader asking themselves, “I dunno, can I?” and clicking to read more. Key into the curiosity gap with a headline like “What Mother Should Have Told You about Banking. (And How Not Knowing is Costing You Friends. )” Ridiculous claim? Maybe, but this kind of headline gets a reader hooked on narrative and they have to click through to see how the story comes together. Number/Trigger word + Adjective + Keyword + Promise = Killer Headline. Many readers still (consciously or not) consider headlines a promise. So remember, as you fill the headline with hyperbole and only write eleven of the twelve tips you set out to write, there is a reader on the other end hoping butter really is good for them. This is where headline science can get ugly. Because a lot of “perfect” titles simply do not have the quality or depth of content to back them. Those types of headlines remind me of the Greek myth of Tantalus. For sharing the secrets of the gods with the common folk, Tantalus was condemned to spend eternity surrounded by food and drink that were forever out of his reach. Now, content is hardly the secrets of the gods, but are we tantalizing our customers with teasing headlines that will never satisfy? So I turn to credible news sources for credible headlines. 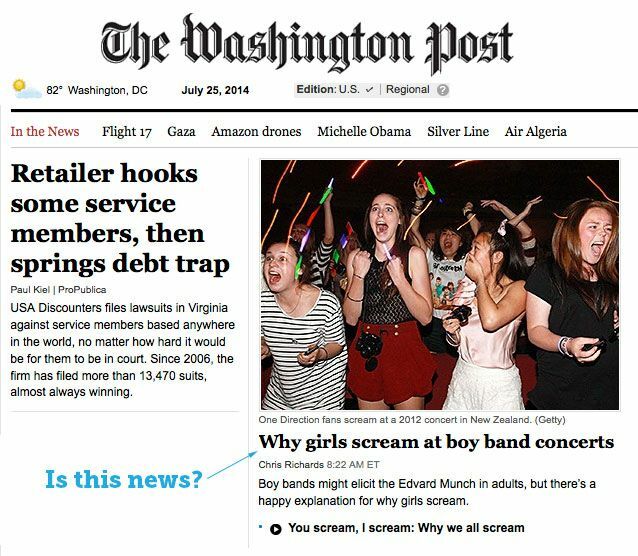 The Washington Post, the fact that they’re covering that topic at all, or that they didn’t really go for true clickbait with something like “You Won’t Believe the Bizarre Reasons Girls Scream at Boy Band Concerts.” But one (or all) of those things makes me very sad. Are we developing an immunity to clickbait headlines? Upworthy is shifting their headline creation tactics a little. But that doesn’t mean they are switching from clickbait, it just means they’ve seen their audience get tired of the same old tactics. So they’re looking for new and better tactics to keep you engaged and clicking. I think many of us would sell a little of our soul if it would increase our traffic, and of course those clickbaity curiosity gap headlines are designed to do that (and are mostly working, for now). But we also want good traffic. The kind of people who are going to engage with our brand and build relationships with us over the long haul, right? Back to what we were discussing in the intro, we want the kind of traffic that’s likely to convert. Don’t we? As much as I advocate for clickable headlines, the riskier the headline I write, the more closely I compare overall traffic (especially returning visitors) to click-throughs, time on page, and bounce rate to see if I’ve pushed it too far and am alienating our most loyal fans. Because new visitors are awesome, but loyal customers are priceless. Yep, you guessed it. I suggested “Your Google Algorithm Cheat Sheet: Panda, Penguin, and Hummingbird” because it contained a trigger word and a keyword, plus it was punchy. I actually liked “A Layman’s Explanation of the Panda Algorithm, the Penguin Algorithm, and Hummingbird,” but I was pretty sure no one would click on it. Last time I checked, that has more traffic than any other post for the month of June. I won’t say that’s all because of the headline—it’s a really strong and useful post—but I think the headline helped a lot. But that’s just one data point. 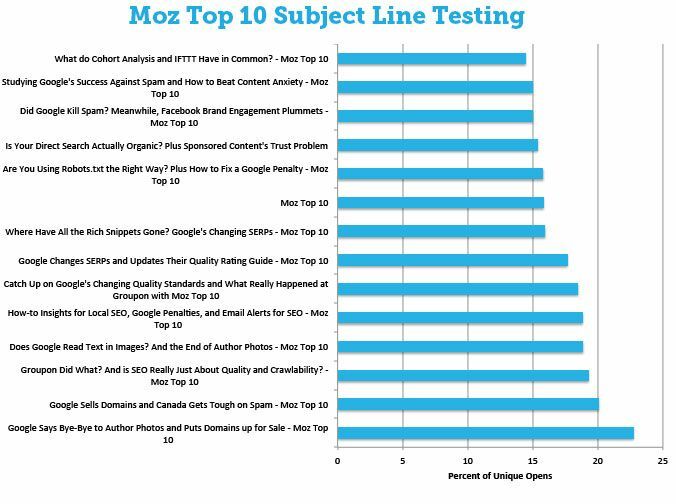 I’ve also been spicing up the subject lines on the Moz Top 10 newsletter to see what gets the most traffic. While the most clickbaity “Groupon Did What?…” and the two about Google selling domains (which was accurate but suggested that Google was selling it’s own domains, which worried me a bit) have the most opens overall. 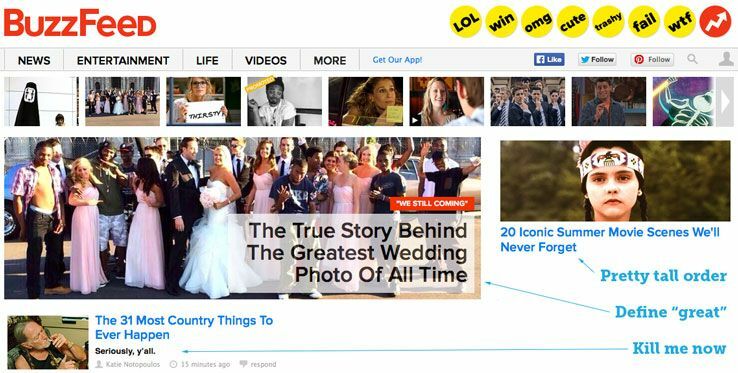 Do clickbait titles erode trust? If yes, do you ever worry about that affecting your bottom line? Would you sacrifice credibility for clickability? Does it have to be a choice? Is there such thing as a formula for a perfect headline? What standards do you use when writing headlines? Does a clickbait title affect how likely you are to read an article? What about sharing one? Do you ever feel duped by the content? Does that affect your behavior the next time? How much of your soul would you sell for more traffic? In recent years there has been a necessary shift in the way businesses advertise themselves to consumers, thanks to the increasingly common information overload experienced by the average person. annual total ad spend in the United States was about $2.8 billion (that’s around $36.8 million before the adjustment for inflation). In 2013, it was around $140 billion. Don’t forget that this is just paid media advertising; it doesn’t include the many types of earned coverage like search, social, email, supermarket displays, direct mail and so on. Alongside the growth in media spends is a growth in the sheer volume of products available, which is made possible by increasingly sophisticated technologies for sales, inventory, delivery and so on. What does this mean? Well, simply that the strategy of ‘just buy some ads and sell the benefits’ isn’t enough anymore: you’ll be lost in the noise. How can a brand retain customers and create loyalty in an atmosphere where everyone else has a better offer? Through tapping into the psychology of social relationships. Imagine that you are at home for Thanksgiving, and your mother has pulled out all the stops to lovingly craft the most delicious, intricate dinner ever known to man. You and your family have enjoyed a wonderful afternoon of socializing and snacking on leftovers and watching football, and now it’s time to leave. As you hug your parents goodbye, you take out your wallet. “How much do I owe you for all the love and time you put into this wonderful afternoon?” you ask. “$100 for the food? here, have $50 more as a thank you for the great hospitality!” How would your mother respond to such an offer? I don’t know about your mother, but my mom would be deeply offended. New scenario: You’ve gone to a restaurant for Thanksgiving dinner. It’s the most delicious dinner you’ve ever had, the atmosphere is great with the football playing in the background, and best of all, your server is attentive, warm, and maternal. You feel right at home. At the end of the meal, you give her a hug and thank her for the delicious meal before leaving. She calls the cops and has you arrested for a dine-and-dash. And herein lies the difference between social norms and market norms. Predictably Irrational: The Hidden Forces that Shape Our Decisions. Ariely discusses two ways in which humans interact: social norms and market norms. Social norms, as Ariely explains, “are wrapped up in our social nature and our need for community. They are usually warm and fuzzy. Instant paybacks are not required.” Examples would be: helping a friend move house, babysitting your grandchild, having your parents over for dinner. There is an implied reciprocity on some level but it is not instantaneous nor is it expected that the action will be repaid on a financial level. These are the sort of relationships and interactions we expect to have with friends and family. Market norms, on the other hand, are about the exchange of resources and in particular, money. Examples of this type of interaction would be any type of business transaction where goods or services are exchanged for money: wages, prices, rents, interest, and cost-and-benefit. These are the sort of relationships and interactions we expect to have with businesses. Positioning: The Battle for Your Mind by Al Ries and Jack Trout (originally published in 1981), the authors describe the 1950s as the ‘product era’ of advertising, when ‘advertising people focused their attention on product features and customer benefits.’ It was all about the unique selling proposition (USP). 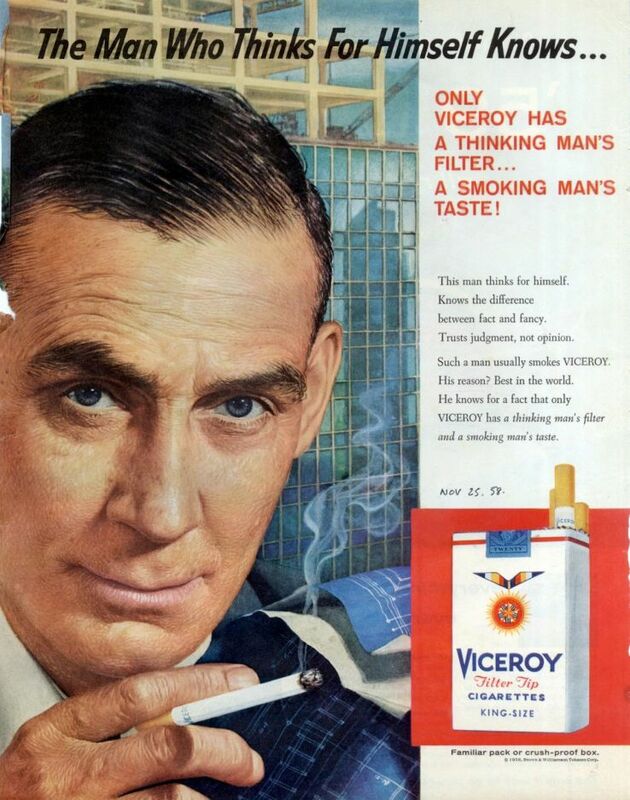 They describe the next phase of advertising (which hit its peak in the 1960s and 70s and which we can probably all relate to if we watch Mad Men) as the ‘image era’, pioneered by David Ogilvy. 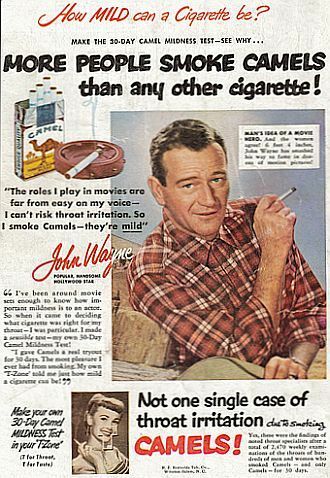 In this period, successful campaigns sold the reputation, or ‘image’ of a brand and a product rather than its features. 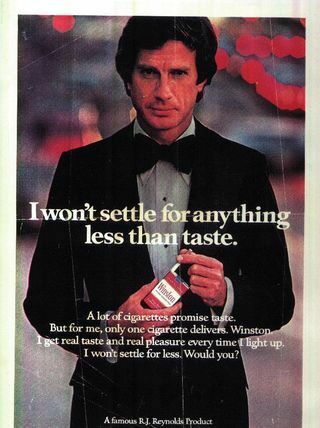 Ries and Trout quote Ogilvy as saying that ‘Every advertisement is a long-term investment in the image of a brand’. Examples include Hathaway shirts and Rolls-Royce. But yet again, as more and more brands imitate the strategy of these successful campaigns, the space gets more crowded and the consumer becomes more jaded and these techniques become less effective. And yet, despite this evolution of advertising strategy over the course of the 20th century, all of these different approaches are ultimately based on market norms. The ‘product era’ sells you features and benefits in exchange for money; the ‘image era’ sells you on an image and a lifestyle in exchange for money, and the ‘positioning era’ sells you on why a particular company is the right one to supply your needs in exchange for money. When does cheap not win? When it comes to social norms. Social norms are about relationships, community and loyalty. If your sister is getting married, you don’t do a cost benefit analysis to decide whether or not you should go to her wedding or whether the food will be better and the travel cheaper if you go to your next door neighbor’s BBQ instead. If anything, it’s the opposite: some people take it to such an extreme that they will go into massive debt to attend friends’ weddings and bring lavish gifts. That is certainly not a decision based on monetary considerations. Tim Allen spoke about in a presentation called “Make Me Love Your Brand, Not Just Tolerate It”. And this is what a large number of recent ‘advertising success stories’ are based on and it’s the whole premise behind many of the more recent trends in marketing: email marketing, personalization, SMS marketing, good social media marketing, and so on. a strong product which they offer at a good price with good ‘market’ benefits like free returns and so on. One example of this is John Lewis, who have good customer service policies around returns etc but also offer free perks to their shoppers, like the maternity room where breastfeeding mothers can relax. One of my colleagues mentioned that, as a new mother, his girlfriend always prefers to shop at John Lewis over other competitor stores for that very reason. Now if this is purely a convenience factor for her, and after her child is older she stops shopping at John Lewis in favor of a cheaper option, you could argue that this is less of a social interaction and more market influenced (in some sense it serves as a service differentiator between JL and their customers). However, if after she no longer requires the service, she continues to shop there because she wants to reciprocate their past support of her as a breastfeeding mother, that pushes it more firmly into the realm of the social. Coca-Cola Santa truck in the UK) has become something which people look forward to each year because it’s a heartwarming little story more than just an ad for a home and garden store. Their 2012 ad was my favorite (and a lot of other people’s too, with over 4.5 million Youtube views). Sainsbury’s response to the little girl who wrote to them about ‘tiger bread’. The catch is, you have to be careful and keep the ‘mix’ of social and market norms consistent. Richard Fergie also summed this issue up nicely in this G+ post about the recent outrage over Facebook manipulating users’ emotions; in this case, the back-stab effect was due to the fact that the implicit agreement between the users and the company about what was being ‘sold’ and therefore ‘valued’ in the exchange changed without warning. The basic rule of thumb is that whether you choose to emphasize market norms or social norms, you can’t arbitrarily change the rules. the average American aged 18-64 spends 2-3 hours a day on social media, it is only logical that we would start to see brands and the advertising industry follow suit. But if this is your only strategy for building relationships and interacting with your customers socially, it’s not good enough. Instead, in this new ‘relationship era’ of advertising (as I’ve just pretentiously dubbed it, in true Ries-and-Trout fashion), the brands who will successfully merge market and social norms in their advertising will be the brands which are able to develop the sort of reciprocal relationships that we see with our friends and family. I wrote a post over on the Distilled blog about what social media marketers can learn from weddings. That was just one example, but the TL;DR is: as a brand, you still need to use social media the way that normal people do. 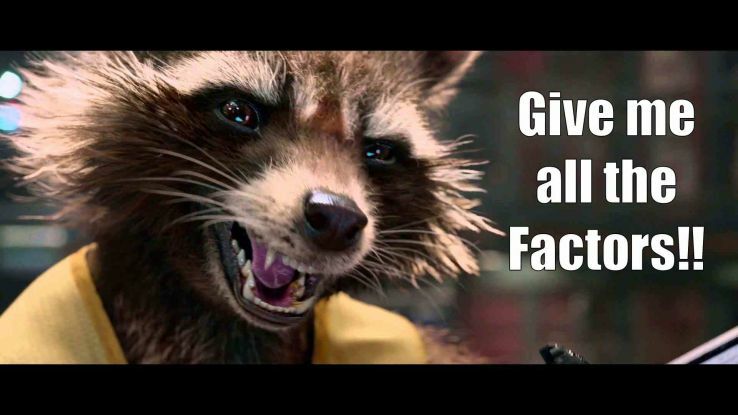 Otherwise you risk becoming a Condescending Corporate Brand on Facebook. On Twitter too. Hannah Smith talked about this in her post on The Future of Marketing. Moz themselves are a great example of a brand with strong values: for them it’s TAGFEE. Hannah also gives the examples of Innocent Drinks (sustainability), Patagonia (environmentalism) and Nike (whose strapline ‘Find Your Greatness’ is about their brand values of everyone being able to ‘achieve their own defining moment of greatness’). ‘Meaningful Brands Index’ (MBi), based on how much a brand is perceived as making a meaningful difference in people’s lives, both for personal wellbeing and collective wellbeing. Whether or not you like their approach, they have some interesting stats: apparently only 20% of brands worldwide are seen to ‘meaningfully positively impact peoples’ lives’, but the brands that rank high on the MBi also tend to outperform other brands significantly (120%). Now there may be a ‘correlation vs causation’ argument here, and I don’t have space to explore it. But regardless of whether you like the MBi as a metric or not, countless case studies demonstrate that it’s valuable for a brand to have strong brand values. t has to be relevant to what you do. If a bingo site is running an environmentalism campaign, it might seem a bit weird and it won’t resonate well with your audience. You also need to watch out for accidental irony. For example, McDonalds and Coca-Cola came in for some flak when they sponsored the Olympics, due to their reputation as purveyors of unhealthy food/drink products. Nike’s #FindYourGreatness campaign, on the other hand, is a great example of how to tie in your values with your product. Another example is one of our clients at Distilled, SimplyBusiness, a business insurance company whose brand values include being ‘the small business champion’. This has informed their content strategy, leading them to develop in-depth resources for small businesses, and it has served them very well. t can’t be so closely connected to what you do that it comes across as self-serving. 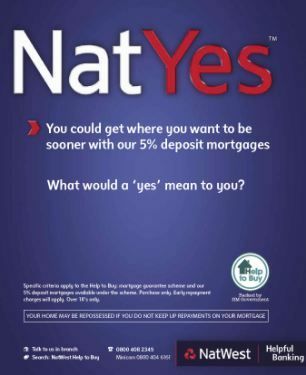 For example, NatWest’s NatYes campaign claims to be about enabling people to become homeowners, but ultimately (in no small part thanks to the scary legal compliance small print about foreclosure) the authenticity of the message is undermined. only 32% of people feel that brands communicate honestly about commitments and promises. So choose values that you do feel strongly about and follow through even if it means potentially alienating some people. The recent OKCupid vs Mozilla Firefox episode is an illustration of standing up for brand values (regardless of where you stand on this particular example, it got them a lot of positive publicity). So what can we take away from these basic principles of social norms and market norms? If you want to build a brand based on social relationships, here’s 3 things to remember. Your brand needs to provide something besides just a low price. In order to have a social relationship with your customers, your brand needs a personality, a tone of voice, and you need to do nice things for your customers without the expectation of immediate payback. You need to keep your mix of social and market norms consistent at every stage of the customer lifecycle. Don’t pull the rug out from under your loyal fans by hitting them with surprise costs after they checkout or other tricks. And don’t give new customers significantly better benefits. What you gain in the short term you will lose in the long term resentment they will feel about having been fooled. Instead, treat them with transparency and fairness and be responsive to customer service issues. You need brand values that make sense for your brand and that you (personally and as a company) really believe in. Don’t have values that don’t relate to your core business. Don’t have values which are obviously self-serving. Don’t be accidentally ironic like McDonalds. Have you seen examples of brands building customer relationships based on social norms? Did it work? Do you do this type of relationship-building for your brand? The SEO landscape has changed so much in the last few years in the wake of the Penguin and Panda apocalypse that the discipline is now considered in the broader terms of online marketing or digital marketing. The one element that is common is the requirement for new skills such as PR, classic marketing and most importantly: creativity. Agencies and freelance individuals who can’t adapt, evolve and embrace the new mode of thinking/operating are vulnerable with nowhere to hide behind mediocre work and outdated tactics. Be more creative, is a phrase often used within business and marketing with little consideration given to its meaning. But, what does it mean to be creative? There is much confusion about what creativity is and a general misconception of mistaking style for creativity. Most designers are stylists: they make things look good. Creativity is about concepts, ideas and innovation. In art school, I was always taught that being able to justify the concept was the most important element of creativity. You had to argue your reason for why the design piece was a solution to the problem. I can still recall how nervous I used to get before a group critique session (the phrase blood bath comes to mind) even though it was over 20 years ago. It’s not about how good it looks – it’s how well it answers the questions. Creativity is a skill we can all access. Everyone has the capacity to generate ideas. Admittedly, some people are more inclined towards creative thinking, just as some are able to figure large maths calculations in their head or swim like Michael Phelps. But anyone can increase his or her level of creativity by learning the skills of thinking and exercising their idea muscle. Ex Monty Python, John Cleese understands and defines the creative process as learning to switch between two states or modes: open and closed. When we are under pressure and stress to deliver, such as in our everyday working lives, we are in closed mode. When we are relaxed, detached from problems and playful, we are in the open mode. Open can be considered playful (lateral thinking) and closed logical (vertical thinking). Just as we need both lateral thinking and vertical thinking, we need open and closed states to solve a problem: the open state allows us to develop creative ideas and then the closed state to plan and implement the idea. These are similarly aligned to vertical and lateral thinking processes. Schedule time to avoid being distracted and remove the pressure to instantly generate ideas; your brain needs time to open up. The optimum amount of time is 90 minutes, it takes a minimum of 60 minutes for the brain to focus on a task and after 90 minutes will be prone to distraction and need a break. Place of work is essential for creatives to get into state – most writers and artists will follow a routine and often have isolated spaces such as garden offices to minimize distraction. Some artists need to be surrounded by ephemera such as the collection of memorabilia that Paul Smith surrounds himself with for inspiration. Others, like Maya Angelou, prefer minimalism and, like myself, need an uncluttered desk and space for an uncluttered mind to be able to think. Agatha Christie preferred to work in a large Victorian bath whilst eating apples. Benjamin Franklin would work naked for an hour every morning. Maya Angelou preferred the isolation of a hotel room and requested everything removed from the walls; she would bring her own sherry and ashtray. The eccentric poet Dame Edith Sitwell would lie down in a coffin finding inspiration in the claustrophobic and restrictive space. You don’t need to go to the extremes of a coffin but find a space which is conducive to relaxation and without distraction, anywhere that removes you from association with work or pressure (preferably not home). Try a coffee shop (JK Rowling famously wrote Harry Potter in her local coffee shop), the library, a hotel or even a camper van (Breaking Bad style). Removing yourself from the usual place of work will remove yourself from distraction, help the brain to break pattern which in turn will switch into a more receptive state for ideas. The open state thrives in humor and play so try the dinner party technique: create the dream dinner party guest list, such as Einstein, Da Vinci, Churchill, Kennedy or even fictional characters such as Don Corleone, Jack Sparrow and Luke Skywalker. Each person should take a persona and become their character – they must answer questions and think like they would imagine that character to think. The perfect warm up exercise; it is huge fun, encourages humor, it breaks awkwardness and forces the brain to break pattern from your normal style of thinking. Keep this game going for a minimum of 20 minutes before your brainstorm. Research has shown a correlation between increased dopamine and creativity. Dopamine is a pleasure chemical which the brain releases to signal success but this chemical is not as straight forward and predictable as a reliable tool. The increase of endorphins will elevate our mood and help us achieve our open state: physical exercise is one of the easiest ways to access a rush of endorphins although, spicy food, sexual activity and pain can also trigger release – so whatever gets you going! Try a walk, swim or bike ride to stimulate feel good. You want to ensure a careful balance of feeling exhilarated but also avoiding energy depletion. Opt for a route that you haven’t been on before to break any automatic behavior patterns. Walking in a new part of town and observing the unfamiliar territory or running backwards will stimulate new thought and movement patterns thus putting you into a more creative and receptive state. The ability to make connections and see relationships between seemingly random elements is the secret to creativity. Combining old elements to create something new. 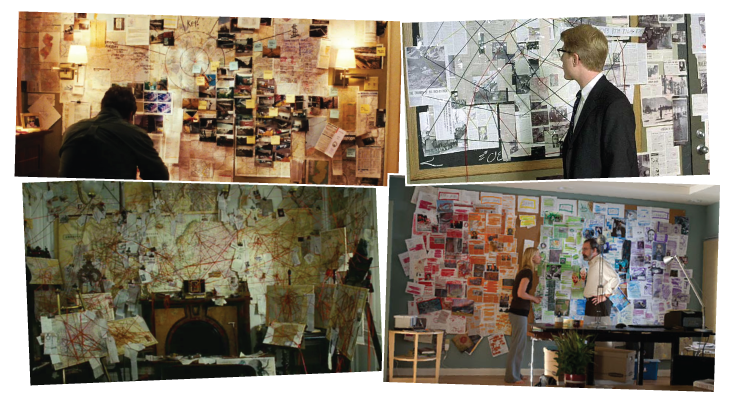 It’s no coincidence that you see examples of ideas walls on TV dramas and movies such as: Homelands, Sherlock Holmes, A Beautiful Mind and Three and a Half Days Later. Detectives have long used this technique to assist solving crimes. Placing photographs of the known or suspected perpetrators, victims, crime scenes and evidence on a wall enables items of evidence to be repositioned and grouped; string can link items together for visual affect. A detective can then stand back and mentally take in a great deal of information at once. The brain begins to process and use its natural ability to seek the connections between the items, find the clues and answers to the case. When the BBC conducted a site redesign in 2010 they printed out the entire site and mounted on a wall affectionately known as ‘the wall of shame’. To enable them to better visualize what they had and to unify the visual and interaction design of the desktop and mobile sites. Tools needed: paper, colored pens, highlighter pens, print outs of all reference material, colored string and push-pins, post it notes, blu tack or tape, and a large wall space, pin board or sheets of foam board. Organize your reference material into themes or groups and pin/stick to the wall. By grouping related themes we start to see patterns. If you have a piece that doesn’t fit into a group this ‘outlier’ could in itself give ideas. 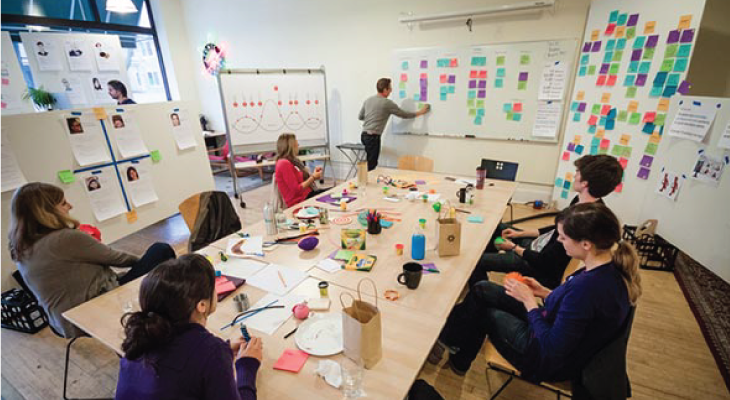 The key here is flexibility: move pieces of paper round, create new string links, devise new groups – by repositioning, regrouping and relinking this is where your ideas will start to form and generate as you begin to make the connections. If wall space is an issue or you prefer a digital version, Mural.ly is an online alternative to creating an ideas wall; describing itself as “an online whiteboard designed to visually organize ideas and collaborate in a playful way.” Mural.ly allows collaboration of team members and you can drag and drop your reference material onto the white board and reposition items and make notes. 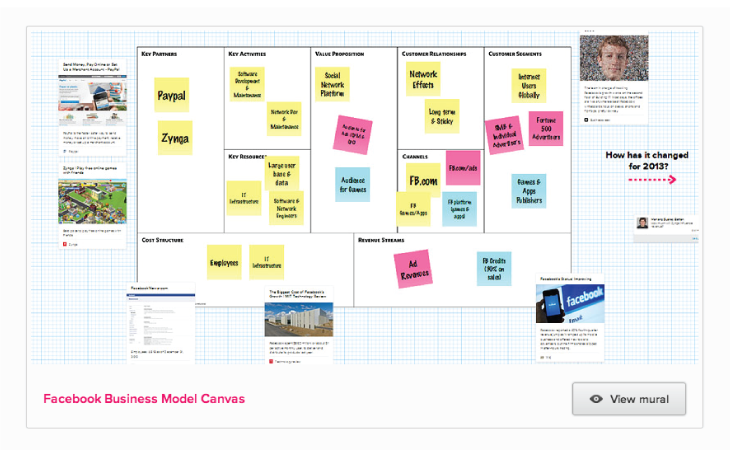 I have only just begun to play with this tool and it has huge depth and potential to assist in creative projects. Pinterest is one of my favourite scrapbook tools for collecting visual information as an alternative. I use Evernote extensively for collecting information and research material. Quora is my favourite site for finding ideas for content. Generating ideas for content, marketing strategies or even creative use of data can all be more productive if tackled in a group – the synergy from more than one person will bring fresh perspective, new ideas and energy. But, brainstorming is such a common term that most people don’t consider how to undertake a session effectively. One of the most important elements within team idea generation is trust and harmony. The group must be able to work well together through respect for each others’ opinions and ability and a general air of amiability. Any disagreeable personalities, critical individuals or large egos are not conducive to successful creative brainstorming and should be excluded from the group. A diverse range of skills present in the group works well in bringing alternative approaches, as does varying levels of experience, age, gender and personality. Allocate enough time to warm up and to focus. Between an hour and 90 minutes is preferable – after this the brain loses focus and needs a break. I recommend the ‘dinner party’ game above or another icebreaker to create an open state. Allow the most junior person in the room to speak first and in turn to most senior. This removes any pressure from a junior member who may be intimidated to follow an experienced authority. Stay focused on the topic. It is natural in group discussion to lose focus and drift into other subjects. The moderator must be vigilant in this area. An experienced moderator is essential to the process and should be able to direct and manage the group without obstructing and keep the group on track and focused and ensure everyone follows the rules (such as not being negative or overbearing). The moderator will take notes (on a white board) and assist as an objective opinion to draw connections between ideas. Above all else no judging, criticism or rejection of any idea – anything is valid and can be considered. If your natural disposition is not creative a creative thinker you can become more creative through repeated action, discipline and learning new ways to think. The more the brain processes a routine or skill, such as a new language or driving a car, the deeper the synapses physically carve a channel in the brain. Which explains to some degree why when we first learn a skill we have to concentrate intensely; it takes a great deal of energy, but through applied discipline it eventually becomes almost automatic and we don’t appear to think about what we are doing, the subconscious takes over. The purpose is not to create ideas you will act on or even sensible, rational or reasonable ideas. This is gym training for the mind only so don’t get precious with your lists. Your first few lists may appear deceptively easy but as you begin to run out of obvious ideas you have to work hard just to think of list ideas and ten new ideas for my ten new ideas list is going to make your brain work for it. Don’t make the mistake of underrating this exercise; everything improves and becomes easier with practice and repetition. My advice above all else is to read as widely as possible as I believe this feeds a creative mind more than any other activity. Just as athletes can only achieve their personal best if they eat a highly optimized diet, creatives need quality brain food and mental stimulation on a regular basis to operate at their creative best. You get out what you put in.